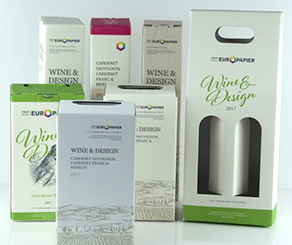 New series of papers, spectacular packaging and labels from Europapier presented with design by ADV Agency ltd.
Europapier, present at a special event their latest spectacular product series, designed by your design team for packaging and wine labels. Besides graphic design, we can also help our clients in the field of pre-press and printing. We offer design and printing of a rich portfolio of luxury and quality boxes, packaging and labels for commercial products – alcoholic and non-alcoholic beverages, food products, accessories and more. We strive to respond to all customer expectations in terms of sales and pricing. revolutionary ecological paper from agro-industrial waste - corn, citrus, kiwi, olives, almonds, hazelnuts and coffee. Applications: luxury packages, labels, cards, business cards, brochures. висококачествен картон с гладка повърхностна структура, който предлага добра печатаемост. Приложения: луксозни опаковки, календари, картички. ColorStyle Leather - high quality cardboard, leather imitation. It has good durability, plasticity and excellent printing capabilities. Applications: packaging, boxes, covers and hard coverings, calendars and cards. has a ribbed surface structure and can be combined with other VIA collections in different designs. Applications: promotional materials, envelopes, annual reports, brochures and other corporate materials. a collection of writing paper that comes with a new palette of contemporary colours. Applications: promotional materials, envelopes, annual reports, brochures and other business applications. 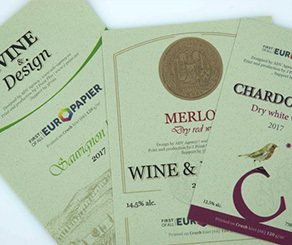 luxury, recyclable and 100% biodegradable paper with excellent print results. Applications - brochures, magazines, packaging and more. strong and water-resistant paper with stone effect. Applications: folders, letterheads, business cards, envelopes, certificates, brochures, reports, calendars, invitations. 100% cotton velvet paper in 4 colors (Cocaine, Smoke, Poudre-Noir, Absinthe). Pur Coton is suitable for screen printing, offset printing and finishing processes, such as hot stamping and embossing. available in ecological colors with natural impurities made from recycled material. Applications: promotional materials, envelopes, annual reports, brochures and other corporate materials. 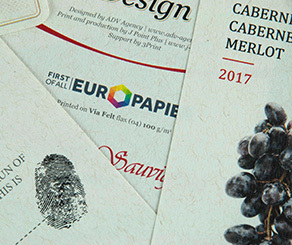 high-quality embossed paper with double-sided effect. Applications: luxury packages and cards. high quality paper with a wood-like surface. Suitable for both packaging materials and marketing materials for the furniture industry, luxury cosmetic packaging and more. The paper can be used for the production of envelopes, covers and postcards. 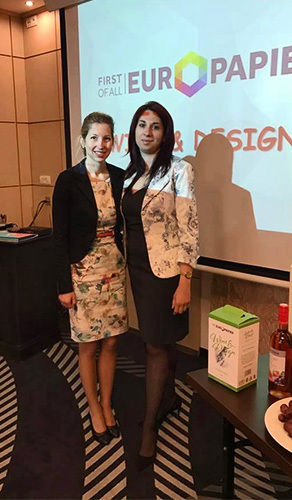 "We sought the assistance of ADV Agency in connection with a special event we wanted to organize. 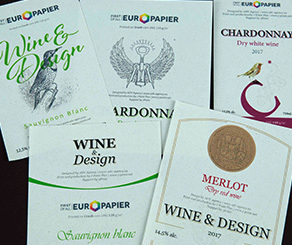 We needed designing of labels and wine boxes so we could print it on our design papers and present them to winemakers. We called the event “Wine & Design. The proposed visions were supposed to be extremely precise, suitable for the focus group of the invited, as well as compatible with the printing conditions and the characteristics of the papers - according to their colour, smoothness or structure. We have assigned this heavy task to ADV Agency and they surprised us with extremely original suggestions. They completed the task in time, despite the difficult coordination between paper delivery, printing and finishing. I recommend them as a credible and creative partner for creating a creative marketing message of all kinds!"